We hiked up to the outlook over Lake Mead then packed up and headed north for the Valley of Fire State Park. The drive through Lake Mead NRA is spectacular with high mountains of all colors and previews of the Valley of Fire. The red rocks here were formed from ancient sand dunes which were fossilized and eroded into exotic shapes. There are caves, natural bridges everywhere. The terrain looks much like the Jumbo Rocks in Joshua Tree NP which were formed from eroded magma bubbles. Tomorrow we will loop back through Las Vegas, visit Hoover Dam, and head for Kingman and I-40.We hiked up to the outlook over Lake Mead then packed up and headed north for the Valley of Fire State Park. 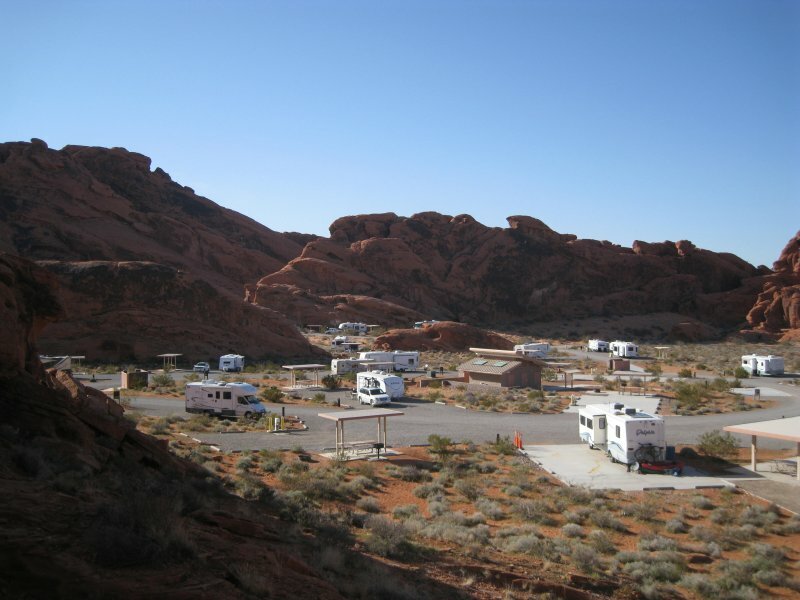 The drive through Lake Mead NRA is spectacular with high mountains of all colors and previews of the Valley of Fire. The red rocks here were formed from ancient sand dunes which were fossilized and eroded into exotic shapes. There are caves, natural bridges, and red rocks everywhere. The terrain looks much like the Jumbo Rocks in Joshua Tree NP which were formed from eroded magma bubbles. The photo shows the campsite. Avoid Site #30 as it slopes so much our levelers couldn't cope. Tomorrow we will loop back through Las Vegas, visit Hoover Dam, and head for Kingman and I-40.